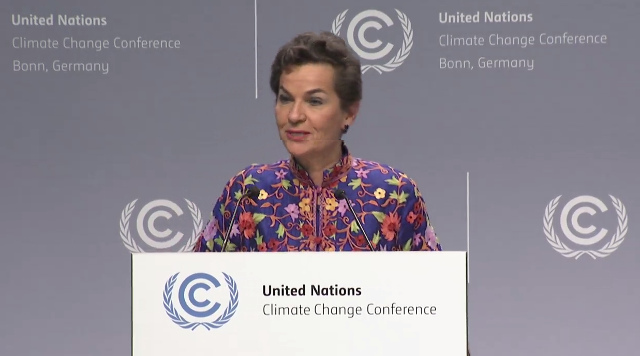 The Executive Secretary of the UNFCCC, Christiana Figueres, is stepping down from her position. She took over the important role in 2010 in time for COP16 at Cancun, after the trainwreck that was Copenhagen COP15 in 2009, and served six years in the role. Slowly she navigated the UNFCCC secretariat, national parties, business, science and civil society groups, building a new consensus, through to concluding the Paris Agreement at COP21 in December 2015. Her final negotiating session as Executive Secretary was the Bonn negotiations this May. Mexican politician and diplomat Patricia Espinosa will take over the role as UNFCCC Executive Secretary from July. A Joint meeting of the Subsidiary Body for Implementation (SBI), Subsidiary Body for Scientific and Technological Advice (SBSTA) and Ad-Hoc Working Group on the Paris Agreement (APA) said farewell. UN conferences are made up of interminable meetings. At this meeting some of the civil society NGO delegates made an intervention in the proceedings ....in song. See that woman, watch her lead, diggin' the Climate Queen. You came in to give us that zing. Your spirit made us cheer. Climate Queen, moving us to a future clean. We are so glad you did. If you think Christina had it easy in a dream job, listen to her explain in this TED talk filmed in February 2016 at Vancouver: The inside story of the Paris climate agreement. How would you go if your job was to save the planet, and you had no control over nearly two hundred feuding competitive parties. Could you bring all these parties together to make a consensus agreement? Yes, the agreement is far from perfect. But Christina and the UNFCCC secretariat somehow managed to navigate through myriad pitfalls to bring nations together to make this landmark agreement. And now we need to implement the agreement. The real work has started. Thankyou Christiana for your inspiration and dogged determination.